The Copper Leaf Oblong Party Tub is a classic and practical way to celebrate your next outdoor gathering. 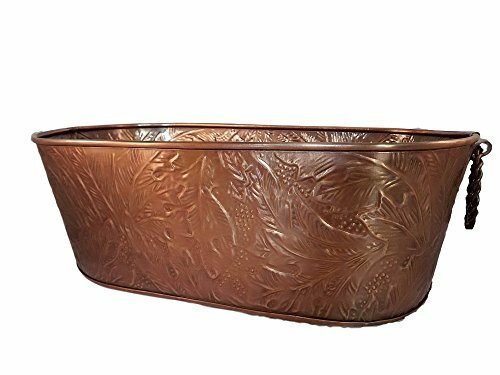 This huge party tub is made of durable copper metal with a leaf pattern relief and copper handles. Fill it with ice and beverages and let the party begin. It is the perfect over sized ice display for your next party or event measuring 21x12x8". Copper Tub doubles as a beautiful planter or flower holder. When it comes to ice tubs for parties or weddings, this copper beverage tub is all you need. It's large size, 21x12x8, will accommodate all your drinks and ice in this cooler bucket, chiller tub. If you have any questions about this product by KINDWER, contact us by completing and submitting the form below. If you are looking for a specif part number, please include it with your message.